Gelato is everywhere in Milan, Italy, and you can never have enough gelato. There are lots of stores I wasn't able to try because there wasn't enough time or they were far away from our accomodation. As you may have noticed, I combined one of the older posts in this post. 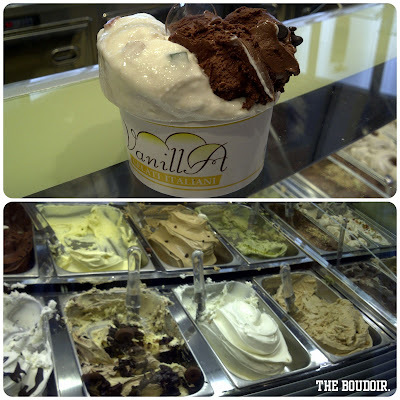 And I'll write two more posts with places that have good gelato. 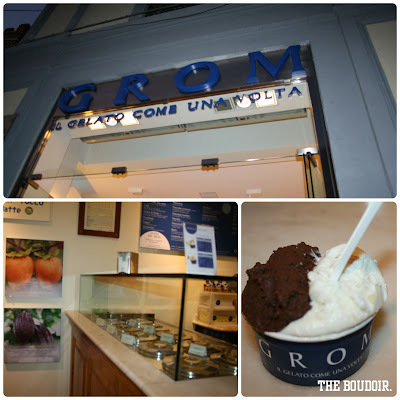 Grom is one of the most popular gelato shops in Milan, they have five branches scattered around the city, including the one near Dogana Del Buongusto restaurant (previous post), one in Via S. Margherita (near Piazza Duomo and Galleria Vittorio Emanuelle II), and on Corso Buenos Aires, the longest shopping street in Milan. I had the darker than dark chocolate (without milk) and Cassata Siciliana. The first chosen flavor was a mistake, it was way too bitter. The latter was better than I could have imagined, tastes exactly like the Cassata Siciliana pastry, a lemony and orange ricotta flavor. In another visit I had the normal dark chocolate and it was just perfect. Nearby on Via Santa Margherita 14/16, is another gelato store called Lato G. Even with the weather being freezing cold I couldn't help but try the lemon mint sorbet gelato, because lemon mint was my favorite juice. It tasted as refreshing as the real juice, in my opinion would be best eaten in the summer. Of course, dark chocolate was my second flavor. Gelateria Vanilla is located on the same street as the side door (lounge cafe) of Starhotel Rosa Grand. Gelato here was also good. The Cassatta Siciliana and dark chocolate were my choices again. I've been dying to visit this gelateria but didn't have the time to. 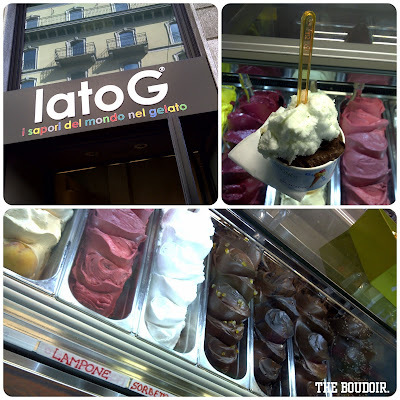 It's one of the best gelaterias in Milan. It closes on Mondays. Hi we live in Milan and we write about ice cream, if you want to see our blog, we talk about a lot of ice-cream stores in the city! abyyyy, i want to go to florence just to have the peach gelato! was heaven! This is one delicious post! I love gelato better than regular ice cream. Less fat yet more flavor! Oh my word, that ice cream looks delicious! Italy is a place which I should definitely visit soon. Thanks for the great posts. me let you know, you will have hit the nail on the head. I would like to point out my appreciation for your generosity supporting visitors who really need assistance with this important area of interest.